Add millet to a pot over medium heat. Swirl for 2-3 minutes, letting millet lightly toast. Add water, vanilla extract, and maple syrup. Bring to a boil, reduce to a simmer, and let millet cook until water is absorbed, 25-30 minutes*. Stir the millet occasionally as it cooks. Once millet is done, remove from heat and stir in the milk. Add more or less milk depending on the texture you desired. Divide into 2 bowls (or eat as one large serving) and swirl in the lemon curd and sprinkle with sunflower seeds. *While stirring, I always check the consistency starting after about 15 minutes and add water as needed. My “simmer” on my stove top isn’t always a simmer. I love that you put sunflower seeds in this. It’s gorgeous, unique, and looks super tasty too! thanks for this – perfect timing! I make Christmas cookies with lemon curd every year, and inevitably end up with leftover curd I don’t know what to do with. Happy Holidays! I just moved away from SF and realized that life is much slower in other parts of the world! I like it but miss the hustle and bustle of the city. 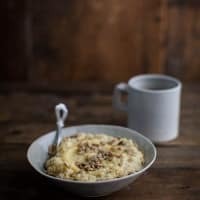 I love lemon curd, but never thought to add it to porridge/oatmeal- good idea! I 100% support your lemon-curd-for-breakfast addictions! I’m a Midwest girl and haven’t experienced hand picking citrus but am crazy about citrus and any type of curd. Safe travels on your way back to the Midwest! I like lemon curd on peanut butter instead of jelly. I also like it on scones. Anything smothered in lemon curd sounds good to me! Plus i have so much millet hanging around my pantry. 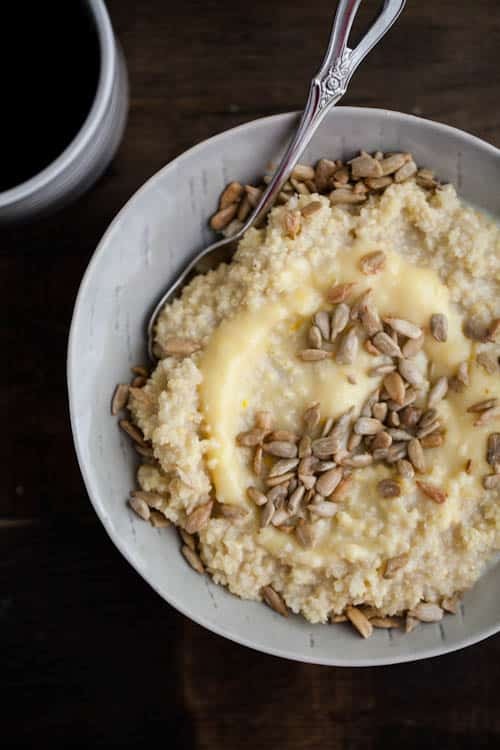 I love how you used sunflower seeds in this recipe, something I need to eat more of. Happy holiday girl! Mu husband just bought like 50 pounds of millet. “We’ll never starve!” he said. I will be trying ALL of your millet recipes! Ha! Absolutely delicious – never would have thought to use lemon curd, but oh my gosh it works so well! I used a pre-made one, made locally in Wales – waiting for half an hour for the millet to cook was long enough for me!!! 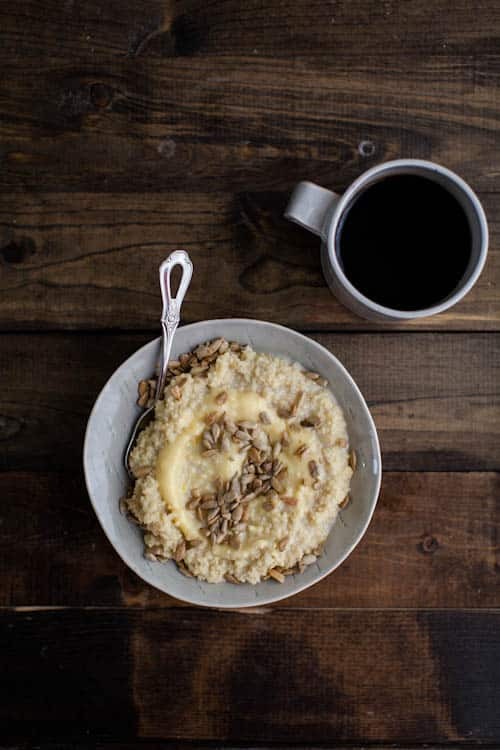 – and stirred in almond milk rather than whole (also used mixed seeds not just sunflower), and it was really lovely. Every time I make millet (okay, twice) it’s always quite gritty. 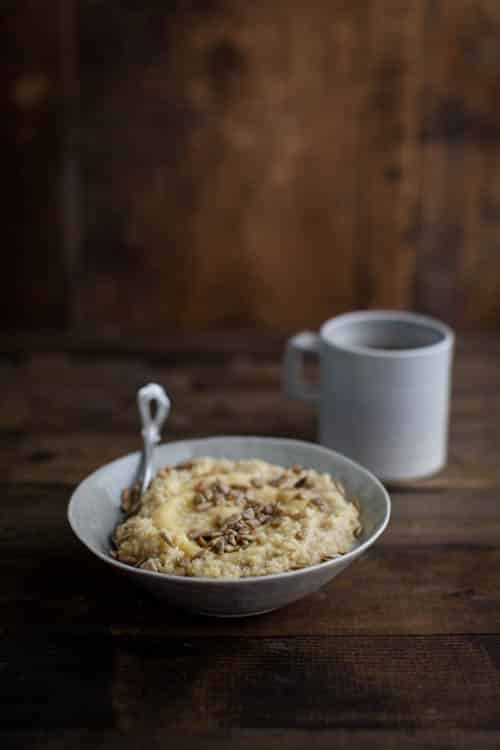 I do like the texture, but I wondered if it was supposed to be a little more mushy/porridge-like, as yours looks in your picture. Hello! Thank you so much for the comment. 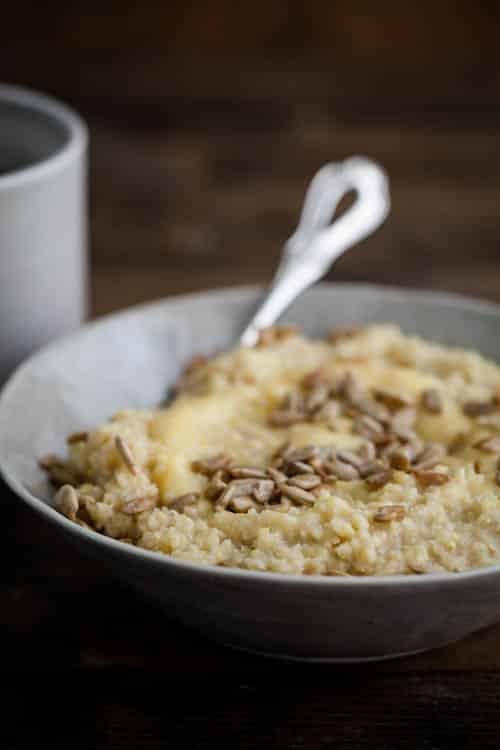 The milk with adds the creaminess (as cooked millet by itself is a fairly dry grain). I think I always cook it a bit longer and with extra milk. The other option is to crack the millet before cooking (whirl it in a blender). This is the easy way to make sure it’s nice and creamy: https://naturallyella.com/creamy-millet-porridge-with-roasted-strawberries/. Hope this helps! That’s super – just read the post. Thank you so much and hope you’re having a lovely morning! I made this for breakfast yesterday- happened to have everything already on hand- it was AMAZING!! I added some wild blueberries right at the end. Thank you for such a great recipe!